Winter is officially here! Gone are the random warm weather days. When we were shopping for this month’s recipe for Phoenix Public Market we asked ourselves what we like to eat when it is this cold. The answer was chili. We love a good hearty chili that sticks to you. In an effort to make it a bit healthier and use ingredients from the market, we came up with our Winter Vegetable Slow Cooker Chili. Our Winter Vegetable is not only a great way to use seasonal vegetables, but it is vegan as well! Hearty and healthy means you can have a comfort food favorite and keep your new year’s resolution. This month’s recipe also features one of our latest discoveries from Phoenix Public Market. We discovered Carefree Spice Company! After trying several of their blends and buying a few for non-site use, we decided to use their Chili seasoning as the base of our chili. Pair that with some delicious winter squashes and turnips (Maya’s Farm has amazing turnips) and you have a veggie lover’s dream! Not to mention, it all goes in the slow cooker! We hope that you enjoy this recipe as much as we enjoyed coming up with it! Next month we will be doing a special recipe for Valentine’s Day! So don’t forget to check back! We’ll see you at the Market! Heat on low for 6-8 hours, until all veggies are tender. This meal will definitely warm you up in the winter… Thanks for sharing! What a delicious slow cooker recipe, chilli is just what we need for cold winter nights. thanks for sharing. I can have soup throughout the year without getting bored. Lovely recipe. Wow! This is so healthy – and tasty at the same time. I really love this soup. Nice recipe to warm the belly of a man in WI! I love the recipe with no meat, crock pot friendly and very healthy! What a delicious and healthy take on chili. I love it! The exact type of meal we need right now! Slow cookers and chili are a match. Love the flavours in this recipe. Making a big batch is something I love to do…and put extra meals away in the freezer. Now thats a power packed lunch. I love chilli and almost always, I dont add any meat in it. Is it really cold even in Pheonix? Crazy winter! I love your vegan version of chili and the selection of seasonal vegetables. I’m curious about the beans needing to be cooked. With that amount of cooking times, would soaked uncooked beans not work? 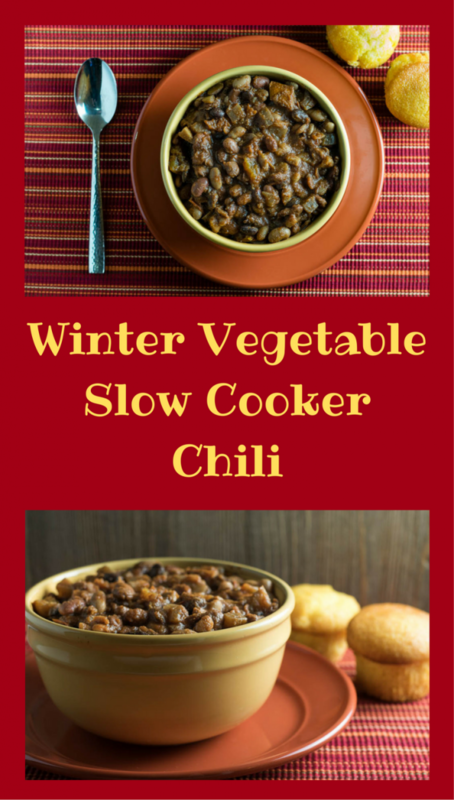 This is a great idea, adding winter vegetables to chili! I didn’t grow acorn squash last year but I do still have some butternut squash stored away, do you think I could swap the two? Nothing beats a nice, big bowl of chili during the cold weather, especially if it is made in the slow cooker. Plus I love that with a little bit of effort you have a weeks worth a meals (at least in my house). Loving your addition of acorn squash in this chili. Looks wonderful, love a good slow cooker recipe, especially for chili! Chili our favorite for cold weather food too! Who doesn’t like comfort food? This is a great healthy version. 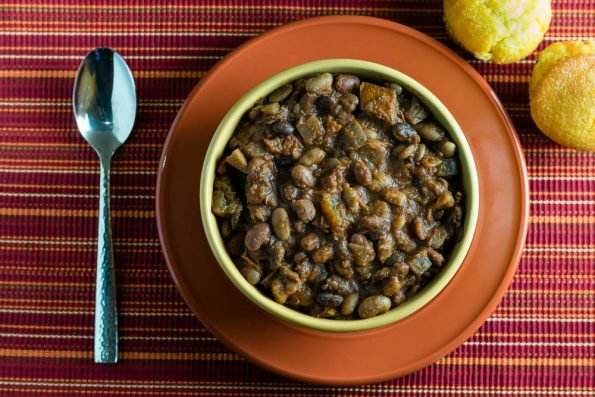 I love the sound of your chili with the turnips & acorn squash! And making it in the slow cooker is even better! This is an awesome chili recipe. I also love the use of local goods in any of my recipes so I love that you use seasonal local veggies.